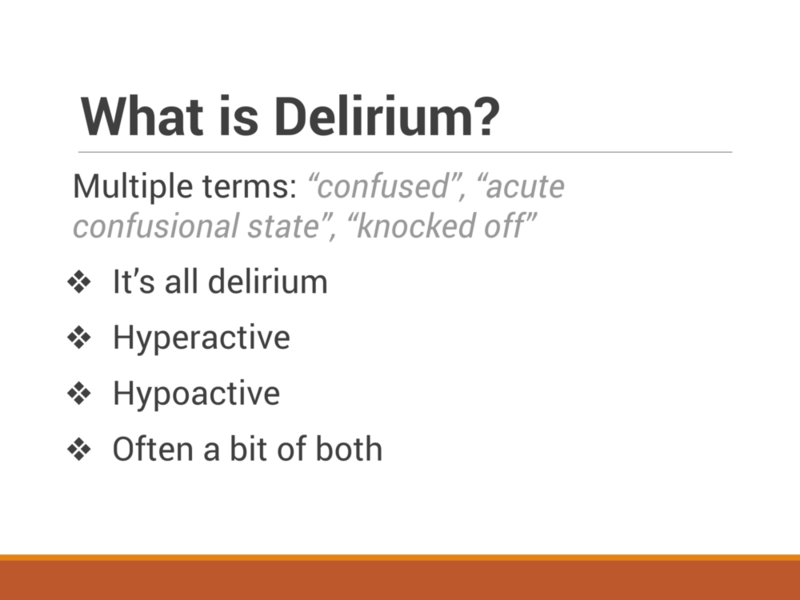 There are many terms used to describe patients with delirium: “confused”, “acute confusional state”, “knocked off” are just a few and I am sure you will have heard others used. 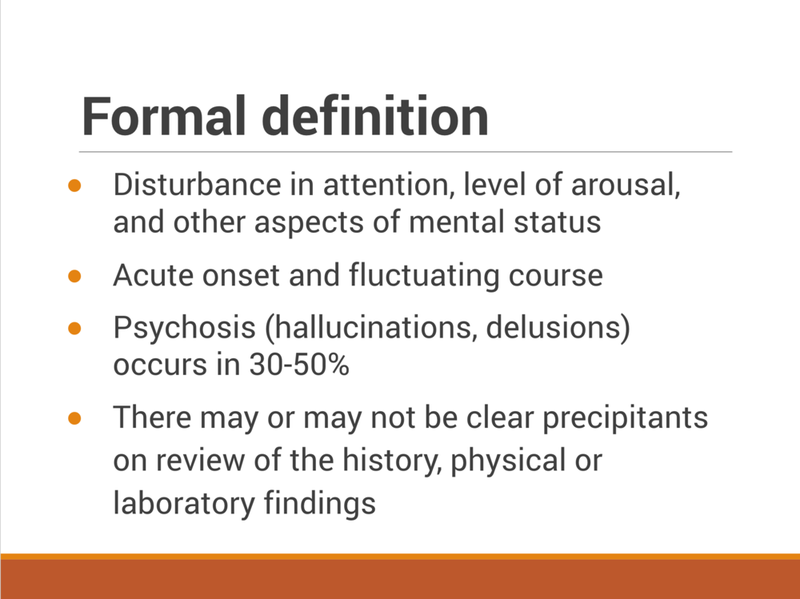 Formal definition: “Acute onset and fluctuating course of disturbance in attention, level of arousal, and other aspects of mental status.” Psychosis (hallucinations/delusions) occur in 30-50%. Why is Delirium a problem? Often multifactorial – constipation, pain, dehydration, hunger, infection and/or illness, medications, urinary retention, environment, lack of cues for orientation (e.g. clock/calendar) can all contribute. The cause of delirium may not be obvious in the ED – accepting uncertainty in acute setting is important. Identification of delirium is a key; therefore screening in the ED is important for initial recognition and early interventions. Different types of screening tools are available and currently most suitable tool for ED environment is being assessed. Failure to detect delirium in the ED is associated with increased mortality and is an independent predictor of increased hospital stay (currently 70% of delirium is not picked up in ED). When used in combination a study showed it identified 93% of delirium cases. There are several interventions that can be made and we should try address these in the ED. ED is a very “deliriumogenic” environment: it is busy and noisy with long waits in chairs or on trolley. There are numerous investigations and movement. Patients may be exposed to a lack of sleep, non-natural lights, and disorientation as to the time of the day. Patients will encounter multiple people in a short period of time.